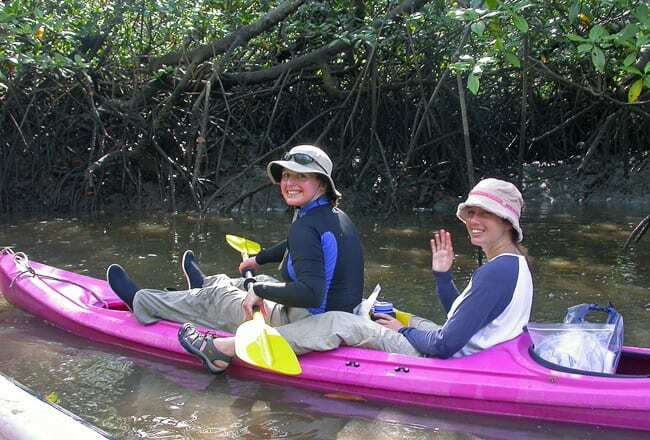 Joanna Gyory’s Ph.D. plans changed completely when she saw the crabs. 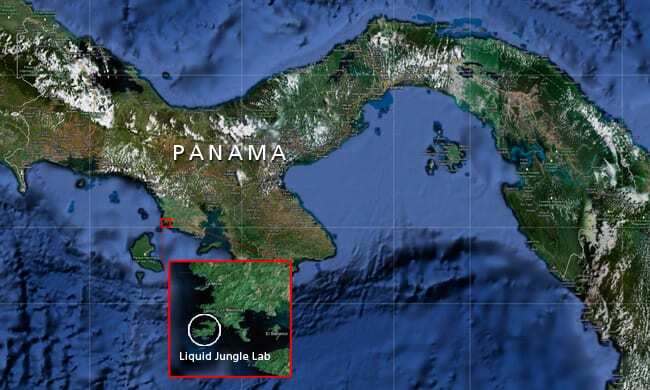 It was her third or fourth day at the Liquid Jungle Lab, a research facility on an undeveloped island off Panama’s Pacific coast. After a dry season lasting several months, it started to rain. 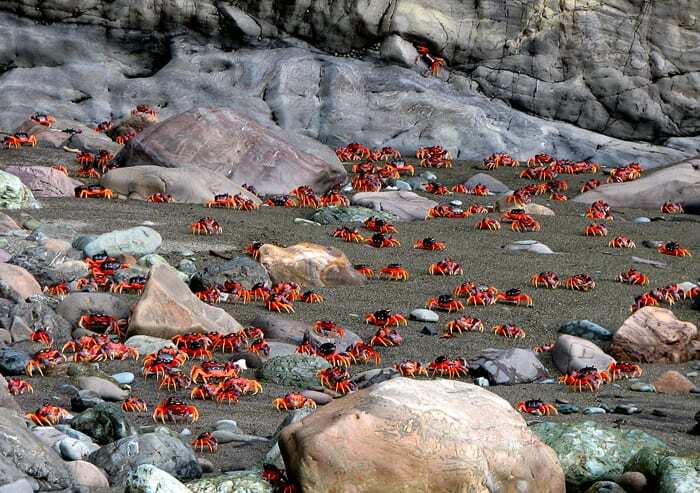 After the rain, like a scene from a 1950s science-fiction movie, mobs of bright red-and-purple crabs emerged and ran down to the shoreline, swarming over the entire beach, crawling over rocks and anything else in the way. The crabs, Gecarcinus quadratus (“square land crab”) live along Pacific coasts from Mexico to Peru. About four inches claw-to-claw, they are abundant, and local residents certainly knew about them. A native Spanish speaker, Gyory got tips from local residents, who told her they saw the crabs in the rainy season. They told her where she could find them, what the crabs ate, and that people sometimes ate the crabs. 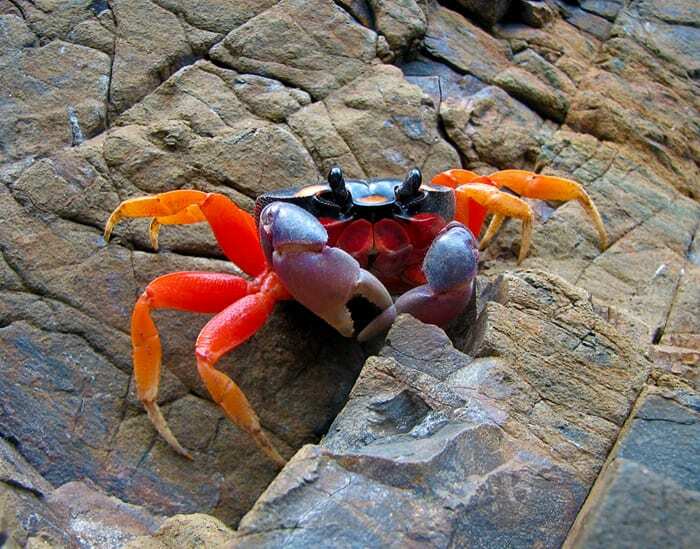 The brilliantly colored adults had been described and named in 1853, but a search of scientific papers told Gyory that no one knew anything about the life cycle of the species—how it reproduces and how it develops from an egg in the ocean to an adult crab on land. 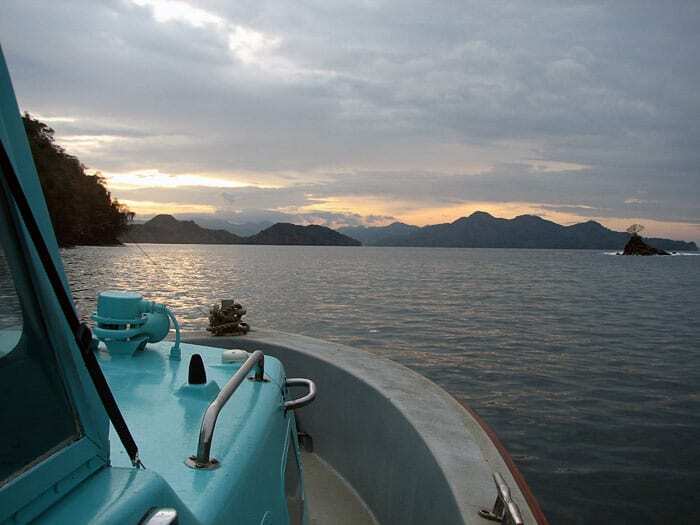 “The coasts of Central and South America in particular have not been studied nearly as well as temperate ecosystems in the northern hemisphere, and many species are still unknown to science,” she said. Every year, scientists find hundreds of previously unknown species. Discovering them is the easy part. The next step—learning the species’ behaviors and the roles they play in their surroundings—requires painstaking, time-consuming observation, which sometimes isn’t done for more than a hundred years. Gyory had found her Ph.D. project: to uncover the life history of Gecarcinus quadratus. Gyory was born in Venezuela and lived there her first 10 years, and then moved to Miami with her family—her father, an architect, her mother, a teacher, and her two brothers. In one way, she was already preparing to study marine crustaceans. “In Venezuela my family would take trips almost every weekend to the beach, and I remember running around looking at logs with barnacles all over them, trying to figure out what all those animals were,” she said. She studied biology at Cornell, then worked at the University of Miami, where she read a study by Woods Hole Oceanographic Institution biologist, Jesús Pineda. It was about how marine larvae are moved around by currents and waves, and it intrigued her. 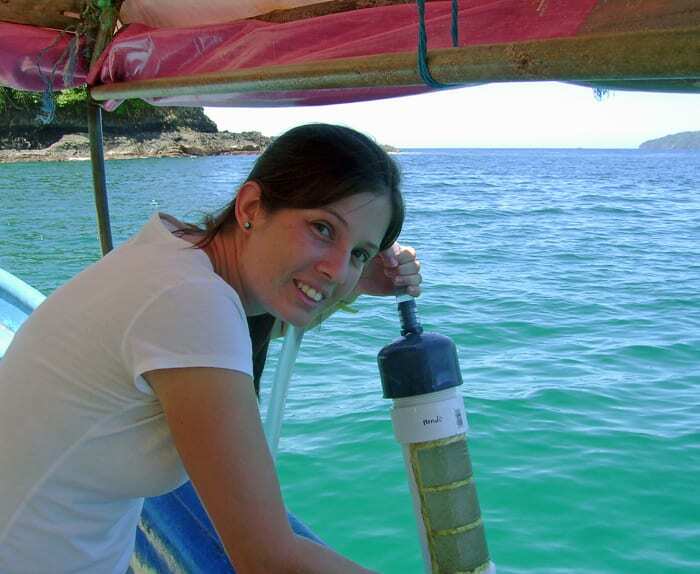 She went on to earn a master’s degree in marine and atmospheric science at Stony Brook University, and when it came time to pursue a Ph.D., “I thought Jesús’s paper was so interesting that I really wanted to come work with him,” she said, “so I decided I would apply to the MIT/WHOI Joint Program.” Pineda became her advisor. Pineda studies internal waves—waves moving within the ocean, beneath the surface—and how they transport and distribute marine larvae and other animal plankton along coasts. Gyory planned to study how internal waves affect zooplankton off the coast of the Liquid Jungle Lab. But then the crabs came out. A Cheshire-cat kind of animal, the square land crabs are there and not there at the same time. During the long dry season, they are invisible. “Desiccation is a real threat to them,” said Gyory. Tucked into burrows in the forest floor, they come out seldom and only at night, to gather leaf litter that they carry back to eat in their burrows. And then one day it rains. 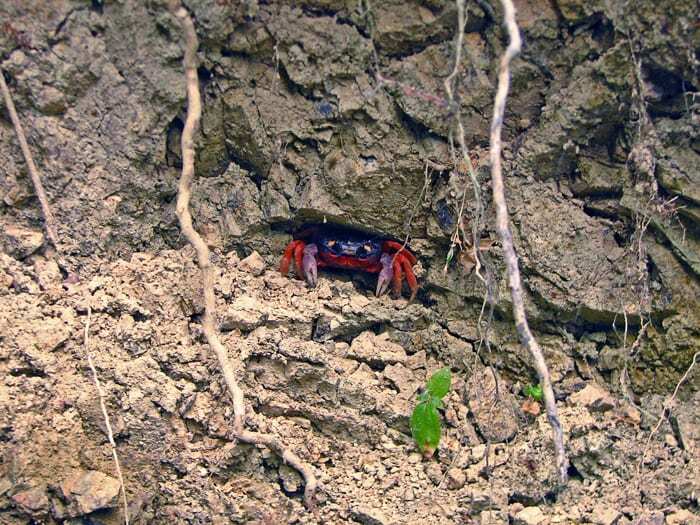 Other tropical land crab species show similar behavior, Gyory learned: Adults mate in the rainy season and migrate to the sea, where females deposit millions of fertilized eggs in the water over the course of a few weeks. Like butterflies or frogs, crabs go through stages before reaching adult form. The eggs hatch into larvae called zoea that spend about a month in the ocean as tiny swimming plankton. 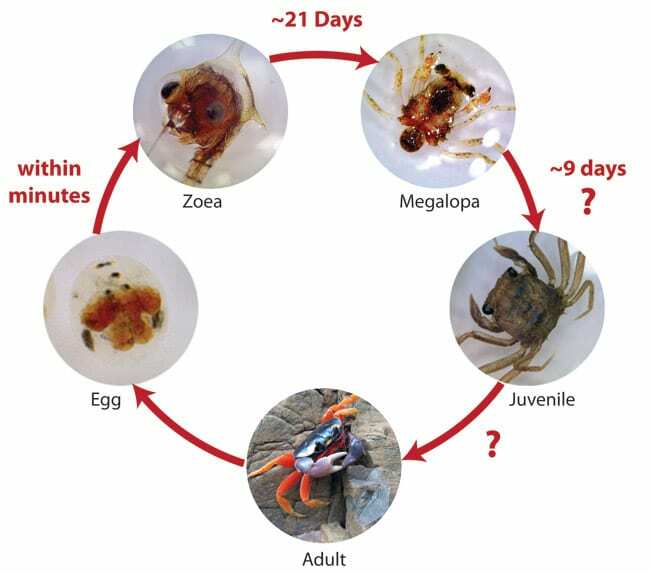 They develop through a few successive zoea stages and then into a second swimming larval stage called megalopa, and later into small juvenile crabs that move onto land, where they will mature into adults. Adults remain on land throughout their lives, which can be a decade long. To tell Gecarcinus quadratus’ life story, Gyory needed to complete the circle—to show that adult migration was linked to rains, reproduction, and the sea, and to show how planktonic eggs became terrestrial adults. Gyory read scientific studies of other land crabs and tried to follow the same methods. First she had to find the larvae. 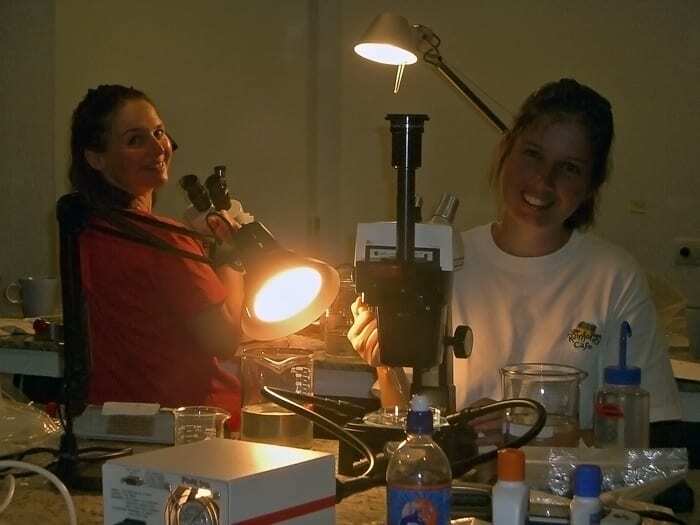 She saw crabs deposit eggs at night and knew the zoea were attracted to lights at night. Nights became her workdays. Gyory and an assistant, Hazel Levine, collected zooplankton in different places in the bay, dozens of yards from shore. Alone on separate boats, every night for almost a month, they took hourly samples with light traps—containers with holes and small lights inside at the base. Plankton attracted to the light, including zoea, swim in through the openings and toward the light and don’t swim out. Every hour the women emptied and replaced the traps, collecting the plankton for sorting back at the lab, a kilometer up the lightless path from shore. 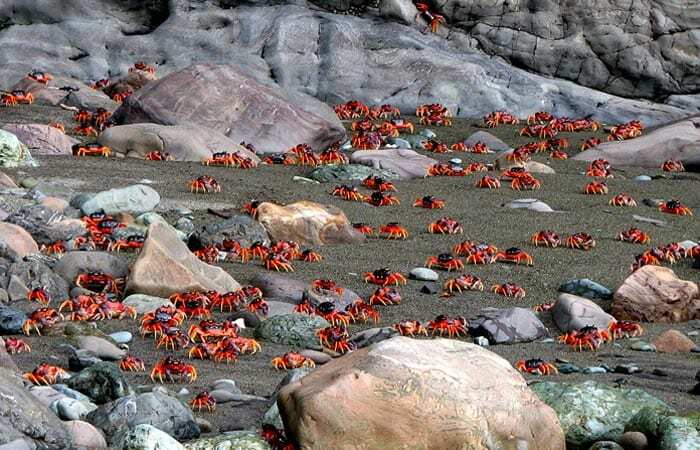 To determine when adults emerged from hiding, Gyory spent days after each of several rainfalls counting crabs along 1-kilometer (0.6-mile) transect lines from the interior of the island to the coast. Most females were already carrying eggs. And from light-trap data, she found they released eggs on outgoing tides—perhaps to reduce predation on the larvae, she said. Trying to rear larval stages into adults to reveal animals’ life cycles has been an aim of natural history from before naturalist Charles Darwin, who himself spent years studying barnacle larvae to work out their developmental stages. But it’s hard to duplicate natural conditions in the lab. For some animals, scientists have never been able to see eggs through to adulthood, and juvenile forms of some animals still have not been identified. Gyory set up laboratory cultures in which she reared larvae from zoea to megalopa. The transformation took 21 days. Just one of her zoea became a megalopa, and she preserved it as a specimen rather than risk it dying in culture. Back in the field, she observed juvenile crabs, the size of quarters, crawling onto land 30 days after the first adult migration to deposit eggs. That suggested that the development time from megalopa to juvenile is nine days. She photographed the crab’s eggs, zoea, and megalopa, documenting their anatomy for the first time. It will take more time and observation to know the full ecological role of Gecarcinus quadratus, but Gyory has made a start. Darwin would have approved. The WHOI Ocean Life Institute and Coastal Ocean Institute provided funding for Gyory’s work. The behavior of her research subjects turned night into day for Gyory (right). She and research assistant Hazel Levine collected plankton in the bay between 9 p.m. and 3 a.m. every night for weeks—and then examined their catch under microscopes. Tracing the circle: Gecarcinus quadratus eggs hatch into zoea when females deposit them in seawater. To identify developmental stages, Joanna Gyory collected new-hatched zoea from the bay and reared them in the lab. After 21 days they had passed through several zoea stages and one metamorphosed into a megalopa. She observed the next stage in the field—the first juveniles came ashore 30 days after the first eggs were deposited—and deduced a 9-day development time from megalopa to juveniles. The time it takes for juveniles to become full adults is still an open question.